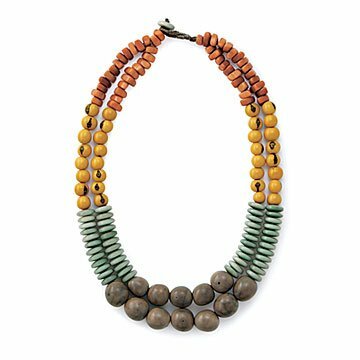 Crafted from tagua nuts, bombona, and acai seeds, each bead in this necklace is carved and dyed by hand. Paola Delgado's handmade necklace highlights wonderfully textured beads with soft, color-blocked hues. Crafted from native South American tagua, bombona, and acai seeds, each bead is carved and dyed by hand to give the design perfect imperfects. Let this necklace shine by pairing it with a white sweater or a breezy sun dress. Handmade in Ecuador. Due to the natural properties of the product avoid prolonged exposure to water and high humidity levels. Wipe clean with damp cloth; Avoid submerging in water; Store away from direct sunlight. I have worn it once and liked the colors and length.